What is your ultimate writing goal? Many writers set out to chart a course for becoming an author – of a book. Are you ready to write your first tome? God calls people of the Word to write and to present the message of the Gospel in a written format that can reach people in need of grace. Will you accept that invitation and consider expanding your writing ministry to include a book? Start by building a theme or title and a short “elevator speech” about your book. Then start writing! Along the way you want to get the word out and build a platform that lets your audience grow. Don’t forget that you have to keep writing so you will get the book ready for publication. Set a regular writing time and stick to it so your book will be gaining pages and taking shape as you talk about it and share the message. Publishing articles is a great way to practice your writing, meet new readers and practice ideas that you might use in your book. Even if you are writing a book, you will still want to spin off articles for Next-Step-of-Faith and other publications. Find a BLOG that you love and contribute regularly. When your book is well underway, consider starting your own BLOG based on your book topic. Many writers benefit from joining a writers’ group or other organizations that help them build expertise in a subject. 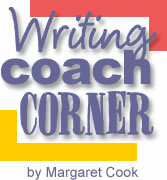 Send your questions about writing a book and the Writer’s Coach column will help you create a plan that will help you publish your book. We love to hear how God is calling you in your ministry as a Christian Writer. Copyright © March, 2008 – Margaret Cook. All rights reserved.